Fill the table below with the appropriate coordinates and graph the quadratic equation, y = -x2 -2x +3. Now, we can substitute the equation with a = -1 and b = -2. By doing so, we can solve for x. With this, we know that the vertex has the x-coordinate of 1. 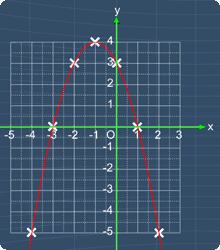 Since the vertex lies on the center of the graph, we can choose the rest x-coordinates using x = -1 as a reference. By drawing a curve to join these points together, we get the graph of y = -x2 -2x +3.